When Big Country performed the last concert on their 2000 “Final Fling” tour, I don’t know how many people really expected it would be the final fling. After nearly two decades together, the band decided to call it quits, and they planned things in their symbolic home: the Barrowlands in Glasgow, Scotland. They shot their first live video there on New Year’s Eve/Day of 1983/1984 and made it a regular stomping ground. For the 18 months after this show in May 2000, I heard occasional rumors the band would regroup, but sadly, that possibility vanished in early December 2001. Singer Stuart Adamson died and with that shocking event, the future existence of Big Country evaporated as well. Not that most of the world noticed. Particularly in the US, Big Country were known as a “one-hit wonder” band. They struck it big in 1983 with The Crossing and its breakout single “In a Big Country”, but after that, they disappeared for most Americans. Most, but not all. Some of us stuck with the band over the years, and that wasn’t an easy feat for folks on this side of the pond. Between 1983 and 1993, Big Country rarely toured the US, a massive point of frustration for me. When they came to DC in December 1983, they played a nightclub I was then too young to enter. They wouldn’t return to the area for a decade, and they then went to the same club! Happily, I was then old enough to attend, and it was a delight to finally get to see this group I’d adored for all that time. Unbeknownst to most Americans, Big Country did continue to work for all those years after The Crossing. They’d produce another seven original albums through 1999, and also put out a mix of additional singles and whatnot. I believe the band did come cross to dissolution in the early Nineties - for complicated reasons, original drummer Mark Brzezicki actually departed for a few years - but for the most part, they continued to plug along, mostly for European audiences. Big Country never toured the US again after those 1993 shows, but happily, I was able to take in one more concert. I toke a trip to England in December 1999 for a series of other shows, and BC were on tour there at the time. This meant I could take in my first BC performance in six years, and I eagerly did so. On this DVD, we find a concert that largely resembles the one I saw in Wolverhampton that evening. I regard that as positive and negative. On one hand, I’m happy to have a good document of the tour, one that supported 1999’s Driving to Damascus album. Six of the DVD’s 22 songs came from that record, and all are good tunes. However, given the historical significance of the show, I would have preferred something a little more out of the ordinary. This was supposed to be BC’s last concert ever, so it deserved more than the fairly standard set list it provided. Some of the old warhorses could have gotten a rest. Some songs were always virtual locks to appear at BC shows. Off of The Crossing, you could almost always expect “In a Big Country” and “Fields of Fire”, and “Chance” rarely fell off the agenda too. From 1986’s The Seer, “Look Away” was another inevitability, and 1988’s “King of Emotion” - off of Peace in Our Time - usually made the cut as well. 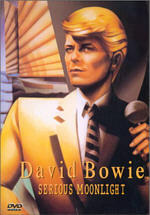 It’s also hard to think of many BC shows without 1984’s single “Wonderland”. I don’t present this as an indication I dislike the Final Fling set list, as it includes a lot of great material that spans the band’s career. From The Crossing, we find a whopping eight of its 10 songs: “In a Big Country”, “Inwards”, “Chance”, “Fields of Fire”, “Harvest Home”, “The Storm”, “Porrohman”, and “Lost Patrol”. (That list omits only “Close Action” and “1000 Stars”.) From 1984, we get the single “Wonderland” as well as two songs from the excellent Steeltown album: “Where the Rose is Sown” and “Come Back to Me”. The Seer offers only “Look Away”, while Peace tosses in “13 Valleys” and the aforementioned “King of Emotion”. As we enter the Nineties, both 1991’s No Place Like Home and 1993’s The Buffalo Skinners contribute “We’re Not In Kansas”. Confused? BC rerecorded a few tracks from Home and issued the new versions on Skinners; the Fling edition of “Kansas” more closely resembles the aggressive Skinners rendition. Off of 1995’s Why the Long Face we find “You Dreamer”. Lastly, six songs from 1999’s Damascus complete the collection: the title song, “John Wayne’s Dream”, “Somebody Else”, “Dive Into Me”, “Your Spirit to Me”, and “The President Slipped and Fell”. Although I stated that I thought I felt Fling included too little to differentiate it from other 1999-2000 shows, the inclusion of so much Crossing material may belie that notion. For a band about to call it quits, it made sense for them to heavily revisit the album that established them. I’d still prefer a greater feeling of a career overview, and some unusual tracks would have been nice - I always badly wanted to hear Steeltown’s “Tall Ships Go” live - but the presence of all the Crossing songs works from a circular point of view. Overall, I felt Fling provided a nice finish for the band. BC never provided a stunning visual act, but they always made sure their passion came out through the music, and that seemed evident here. The concert starts on a high note with the excellent “Harvest Home”, and that symbolic move - it was their first single - gets things rolling. Never the chattiest performer, Stu seems quieter than usual during the show, but the band crank out the songs with a fairly relentless force. How much of Stu’s attitude related to his own personal issues I don’t know, but he may have simply wanted to let the music speak for itself on that final night. As a longtime Big Country fan, I must admit I feel frustrated that the band never got their due. Like I noted, most people have no memory of them beyond 1983, and I can’t deny that BC’s best material came out during their first few years of existence; from The Crossing through The Seer, they did little wrong. However, even weaker albums like Peace In Our Time and No Place Like Home include solid tracks, and Driving to Damascus proved they still had it; it was probably their best release since The Seer. Nonetheless, even if BC had never produced a note of music after 1983, they still merit significant attention. After almost 20 years, The Crossing remains a stunning album without a bad song on it. Of course, some numbers are weaker than others, but it maintains a startlingly high standard, and its best elements demand notice as some of the greatest rock music ever made. In my opinion, The Crossing isn’t even BC’s best album, as I think they topped it with Steeltown, and The Seer comes pretty close to that level as well. In any case, as I heard the umpteenth versions of songs from The Crossing during Final Fling, I couldn’t help but marvel at how little age has diminished the work. The majority of music from 1983 sounds like crap these days; even U2’s War includes some dated elements. But The Crossing could have been recorded yesterday; it hasn’t aged a minute since 1983. Most of BC’s later albums wouldn’t be so lucky; from The Seer on, each record demonstrated at least a few aspects that firmly placed them in their eras. Back in 1983, folks spoke of Big Country and U2 in the same tones, but their popular paths diverged fairly quickly. Both hit it big in 1983, and both released follow-ups in 1984. (Unlike The Crossing, War wasn’t a debut album, but it was U2’s first major success.) While Steeltown pretty much stiffed in the US, The Unforgettable Fire became a big hit on the back of “Pride (In the Name of Love)” and U2 quickly established themselves as one of rock’s most successful acts. Why did U2 prosper while BC fell into obscurity for most folks? I don’t know. Better management? A more magnetic lead singer? A pact with the Devil? It could be all or none of those. While I’m happy for U2’s success, I still feel that BC got the shaft. Although I probably prefer U2 as a band - and they’re definitely much more interesting live - I actually feel Big Country includes the stronger musicians. The Edge is a more notable guitar player, but both Stu and Bruce Watson could hold their own. It’s a toss-up between Adam Clayton and Tony Butler, but behind the drum kit, Mark Brzezicki blows away Larry Mullen. That’s not a slight on the U2 drummer, but few who ever grabbed the sticks could touch Mark. Few drummers so strongly influenced the sound of a band; Mark belongs alongside Keith Moon in that regard, for without him, BC were a radically different - and much inferior - band. When Mark briefly left in the early Nineties, they played with a replacement, but he couldn’t compete. Mark deserves mention as one of the greatest drummers of all-time, and I wouldn’t dispute anyone who thinks he’s the best at what he does. When musicians play with each other for a very long period of time, that bond shows, and such a connection appears during Fling. If it seems like I’ve not said much specific to that concert, it results from the fact there’s little to note. It’s a consistent performance that includes few relative highs or lows. I liked the modest reworking of “13 Valleys”, and it’s great to hear “Where the Rose Is Sown” followed by “Come Back to Me”, just the way they appeared on Steeltown. “Lost Patrol” sounds as rousing as ever, and “Porrohman” provides a good extended piece. In the negative vein, my main complaints relate to two of the oldest chestnuts in the catalog: “Chance” and “In a Big Country”. Over the last 20 years, BC played very few shows at which those songs didn’t appear, and the overfamiliarity shows during Fling. “Chance” always bored me live because it became an annoyingly extended sing-along, and “Country” simply never attained the tightness and passion of the album version. I can’t quibble with the inclusion of either song - they had to appear on such a historic night - but the renditions of both seem lackluster at best. 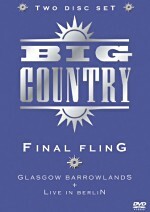 Nonetheless, I found myself pleased with Big Country: The Final Fling. Granted, I love the band so much that I can’t say I’m the most objective party, but the show included a lot of excellent songs, and the performance left little to be desired musically. For long-time fans, the experience undoubtedly will evoke some sadness due to the tragic event that would occur the following year, but I hope folks will try to revel in the sheer joy of an excellent band as they perform some terrific material. Footnote: despite the program’s title and theme, Fling actually doesn’t feature Big Country’s last performance. They performed at an October 2000 festival in Malaysia, of all places. The Barrowlands gig marked their final hurrah as a headlining group who did a full set, however. Big Country: Final Fling appears in an aspect ratio of 1.33:1 on this single-sided, double-layered DVD; due to those dimensions, the image has not been enhanced for 16X9 televisions. While consistently watchable, Fling offered a moderately problematic picture that didn’t seem to match top standards. Most of the issues related to the show’s lighting. It didn’t appear that they did much to balance the lighting schemes for video recording, and this led to a number of issues. White spotlights made the band members look too bright much of the time, and the colored lights could seem overwhelming. For the most part, those hues seemed acceptably tight and didn’t demonstrate much runniness, but they simply dominated the image to an excessive degree. This gave the image a “blown-out” look at times that distracted from the clarity. Sharpness tended toward the soft side of the spectrum, partially due to the lighting. Close-ups seemed fine, as they presented reasonably crisp and detailed images. However, wider shots generally came across as moderately loose and undefined. The sharpness caused no grave concerns, but I expected a tighter presentation. I saw no signs of jagged edges or moiré effects, and the show seemed to lack edge enhancement. Source flaws caused no noticeable concerns. The image showed no artifacting or other distractions in that regard. Black levels appeared reasonably deep and dense, though they also were affected by the lighting; the heaviness of the colors tended to render these other elements as less effective than they might have been. Shadow detail usually seemed visible but a little murky, also due to the thickness of the hues. Overall, I found Final Fling to present an acceptable visual presentation, but it could have looked better. Happily, the Dolby Digital 5.1 soundtrack of Final Fling seemed more satisfying. As one might expect from a concert video, the soundfield maintained a fairly heavy emphasis on the front channels. There I heard good stereo separation and presence for the music. Oddly, the center speakers received little work. Although Stu’s vocals seemed appropriately located in the middle, this didn’t occur because of isolated center channel usage. While the middle speaker did provide some audio, it seemed fairly passive, and most of his singing came from the sides; the mix then created the localized impression of vocals from the center. Final Fling isn’t the only 5.1 music production I’ve heard that neglects the center speaker, but I still don’t understand why they’d bother to do it this way. Nonetheless, I still felt pleased with the audio presentation. Despite the absence of an active middle channel, Stu’s vocals did seem to reside within the appropriate spectrum, and Mark’s drums also came from a logical place in the same area. Guitars receive a nice split that matched the onstage placement of the two men. Stu’s playing came from the right, while Bruce’s cropped up on the left. This all blended together well and created a solid presence. As for the surrounds, they maintained a fairly passive role in the proceedings. The rear speakers added some general reinforcement for crowd and music throughout the show and didn’t seem to do anything else. Unusually, much of the audience sound came from the forward channels; typically, 5.1 mixes put more of those elements in the surrounds. Audio quality appeared solid. Vocals were always natural and warm. The singing showed no signs of edginess or brittleness, as they came across well. Guitars crunch and sting appropriately, and all the playing seemed crisp and distinct. Mark’s drums also showed nice punch and pop, and Tony’s bass made sure that my subwoofer got a lot of usage. Low-end response appeared nicely deep and tight. Overall, Final Fling didn’t provide reference-quality audio, but the music sounded quite good nonetheless. When I needed to rate the supplements on this two-DVD release of Final Fling, I ran into a dilemma. 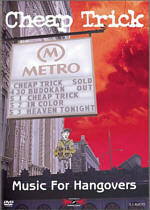 The May 2000 concert appears on the second disc, while the first one includes a different show. 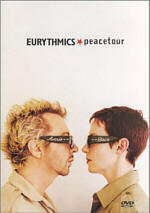 Although the title of the package would seem to refer to only the May 2000 performance, the sleeve seems to regard that other concert as its equal. I didn’t. The Live In Berlin portion of the DVD really makes sense if we consider it as an extra. After all, the May 2000 show runs nearly two hours, and it does give the set its title. Call me arbitrary, but I decided to consider “Berlin” as a supplement. Shot at a 1988 “Peace Concert” festival in East Germany, “Berlin” offers Big Country’s 12-song performance. (Obviously the presence of many other artists on the bill meant they played a shorter-than-usual show.) This piece lasts 78 minutes and 26 seconds. On the negative side, “Berlin” repeats seven songs from the May 2000 concert on the other DVD: “Where the Rose Is Sown”, “Wonderland”, “Look Away”, Porrohman”, “Chance”, “In a Big Country”, and “Fields of Fire”. However, a couple of the other tunes appeared only sporadically over the years. “Restless Natives”, “Just a Shadow” and “The Seer” weren’t frequently played. “Steeltown” wasn’t a real rarity, but it’s a nice addition. The set also includes a cover of the Stones’ “Honky Tonk Women”. Overall, “Peace” offers a good show, as the band play well and seem to be in high spirits. Picture quality actually surpasses “Fling”, as it consistently looks sharper and more vivid. However, it still shows its videotaped roots, and some noticeable edge enhancement appears throughout the performance. Audio quality appears good but somewhat lackluster; “Fling” provides the stronger auditory experience. Without question, the worst aspect of “Peace” relates to a temporary addition to the band. Perhaps in a bow to the musical fashion of the time, BC added a synthesizer player for a while. Actually, I’m not sure how many shows this guy played; I own a few other BC live recordings from the era, and I don’t recall hearing synthesizer on them. Perhaps it’s a mix issue; he may be there on the others but not featured as prominently. Whatever the case may be, he was a very bad choice. BC were a guitar band, and cheesy synthesizers did not work within the context of their songs. Frankly, it’s painful to hear good numbers like “Wonderland” and “Steeltown” with this inane accompaniment. These components don’t ruin the tracks, but the synthesizer sure does harm them. Whose stupid idea was that, anyway? And why in the world did Tony wear a shirt with his own picture on it? In addition to “Berlin”, Fling tosses in a mix of other extras. On DVD One - the “Berlin” disc - we get three previews of other Big Country videos. “Voodoo Lounge” offers a three-minute and 55-second clip from a summer 1995 performance in support of the Rolling Stones; we hear most of “Ships”. Another 1995 concert at “Das Fest” offers a 145-second snippet of “Lost Patrol”. Most interesting is the “Peppermint Lounge” piece. It comes from a 1982 show in New York; the four-minute and 45-second excerpt presents “Heart and Soul”. Surprisingly, the Peppermint Lounge number sounds better than the other two. When we go back to DVD Two - which includes “Fling” - we find a few additional extras. Under the Access All Areas domain, we discover five different subheadings. “Backstage Pass” includes 155 seconds of pre-show footage and also some photos and a tribute to Stu. The “Tour Programme” spans 73 screens and reproduces that document. The “Tour Photos” area offers 30 images, while the “Tour Itinerary” shows 11 tickets. Lastly, the “Tour Rider” runs four screens and documents the band’s demands for each venue. Nothing nutty appears, though their request for “clean ice” seems interesting. One disappointment about the DVD: it doesn’t include the complete Barrowlands concert. At least a couple of songs failed to make the cut. According to manager Ian Grant, this occurred because the band felt displeased with their performances and because the DVD didn’t include enough space. I can accept the former but not the latter. Somewhere in this two-disc set, they could have crammed in an extra 10-15 minutes without any problem whatsoever. Despite their lack of public recognition in much of the world, Big Country produced a surfeit of solid music over almost two decades, and The Final Fling finishes their career on a positive note. While not the strongest performance I’ve seen from them, the show offers a solid presentation of a lot of excellent material as the band let their music stand on its own. The DVD features mediocre picture along with fairly good sound and a pretty strong roster of extras highlighted by a 12-song concert from 1988. For Big Country fans, this DVD is a must-have piece and an absolute no-brainer. Neophytes should also give it a look; even though it offers the band’s last concert, it covers their career well enough to become a good introduction to their strengths.